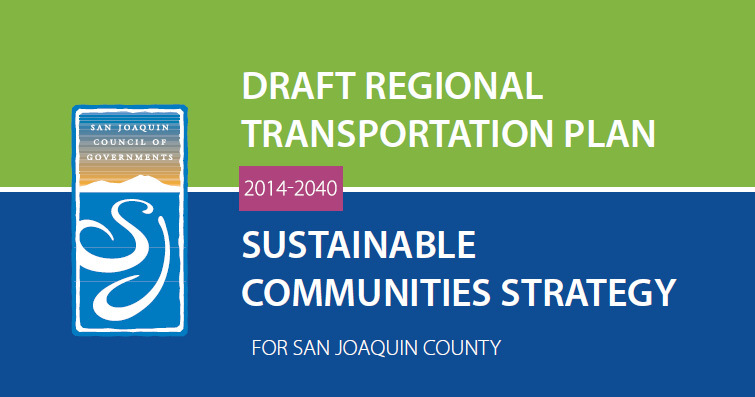 On Thursday, the board charged with setting priorities for San Joaquin County’s transportation system took a modest step toward a more sustainable future by adopting a regional transportation plan that includes the county’s first Sustainable Community Strategy. The San Joaquin Council of Governments passed the RTP/SCS by a 7-2 vote, setting the county’s transportation plan through 2040. It envisions spending $11 billion on transportation projects within San Joaquin County through 2040, including $3.6 billion generated by Measure K, the half-cent sales tax passed by voters in 1990 and renewed for 30 years in 2006. According to SJCOG staff, $3.2 billion will be spent on bus, rail and other transit systems, a 28 percent increase over the previous RTP. Meanwhile, $7 billion will be spent on roadway and highway improvement, and $282 will be invested in “active transportation,” which includes walking and biking. The RTP/SCS also increased the goal for overall housing density in the county, which will encourage tighter growth patterns and infill development while discouraging sprawl on the fringes of cities and in county land. Individual projects were also identified as priorities, including widening Interstate 5 north of Hammer Lane and south of Martin Luther King Jr. Blvd., widening Interstate 205 between I-5 and Interstate 580, increased public transportation services and an expanded system of bike trails. A working group comprised of city planners, developers, housing advocates and transit experts will be put in place to help monitor the progress of the plan. The plan is a response to legislation that requires reduced greenhouse gas emissions, notably Senate Bill 375, which mandates metropolitan areas shrink per capita emissions by 5 percent by 2020 and 10 percent by 2035. In an effort to meet and surpass those goals, SJCOG staff met with members of the public during a two-year process that eventually led to a plan that departs from the status quo of the past, promoting a more dense land use pattern and increasing funding to public and active transportation while decreasing emphasis on roadways and highways. It is a signal that local leaders are serious about tackling issues like suburban sprawl, environmental pollution and a car-centered culture— at least in restrained, measured ways. Smart-growth activists present at many of the meetings leading up to SJCOG’s final vote encouraged even more aggressive measures to reign in suburban sprawl and vehicle miles traveled, a big contributor of greenhouse gas emissions in an area crisscrossed with highways and home to many commuters. In particular, they advocated for an even higher housing density that would encourage more infill development. On the other side of the ideological aisle were groups like the Builders Industry Association, which pushed for a density goal that, while higher than the status quo, was lower than what was ultimately passed. The lower threshold would allow more expansive development of single-family houses. SJCOG eventually settled on a plan between the two poles — a compromise senior planning analyst Kim Anderson called “ambitious and achievable,” and one that drew praise from American Lung Association, The Cort Group and Defenders of Wildlife representatives. The most enthusiastic supporter of the plan Thursday was Stockton City Councilman Moses Zapian, who said the RTP/SJC was a step toward “a more livable, walkable, loveable community.” His motion to adopt the plan was seconded by Stockton Mayor Anthony Silva, who did not speak during discussion of the RTP/SCS. But support was not unanimous. Tracy Mayor Brent Ives and Ripon Mayor Chuck Winn voted against the Sustainable Community Strategy. Though they lauded the goals of the plan, they questioned whether this particular set of strategies was the right way to do it. I can understand the objections from the Tracy and Ripon mayors. It’s like their cities, which are now primed for increased growth, are being penalized for Stockton’s out-of-control decades of sprawl. It doesn’t seem very fair at all. The spill over expansion, though, from Silicon Valley cannot be stopped into the logistical vicinity of Tracy. So if Tracy’s land area growth is limited by the RTP/SCS and if there are no height limitations, then this means it will grow vertically and become a “Mini-Manhattan” with skyscrapers in a relatively rural area that will outshine Downtown Stockton. Cause and effect. Is the SJCOG sure this is what they want? I don’t really see these other regional communities as being immune from sprawl over the last few decades, particularly Tracy and other localities like Manteca, and therefore being unfairly penalized (just driving on the 205 through Tracy is a prime example of fringe development). Tracy continues to develop in a sprawling pattern today, locating large barren office/industrial complexes on its outskirts. Plus, I don’t see height restrictions being waved in any SJ Valley community anytime soon and having a plan that calls for increased infill development simply puts the focus back on already developed downtowns as opposed to continuing to swallow up agricultural lands. I also found Chuck Winn’s comment about everyone in attendance owning three-car garages and four-bedroom homes somewhat offensive and out-of-touch with those he is supposed to be representing. The SJ Valley seriously lacks housing and transportation choices and this plan sets real, measurable goals to increase these choices for residents. “Most of the people I know drive cars, and they live in single-family homes.” Yes, Mr. Winn, because there is no other option. Mayor Chuck Winn is just ‘old school’. He’d like to continue making nice payoffs in return for approving sprawl happy development. I don’t see his argument as valid, I understand what he is saying, but his thinking is quite out of date. Whether you blame strict measures of the approved RTP because of Stockton’s foolish development decisions, the reality is sustainability is not and should NOT be a choice any longer for any of these cities. Are we not in one of the worst droughts ever? Is traffic not getting worse? How’s that respiratory ailment SJC? Every city in the county really should take on a more proactive role in addressing some of these issues that are only getting worse. Now with the new RTP these issues will forcefully but taken off the back burners and prioritized.